Baruch Spinoza was a famous Philosopher from Netherland, who lived between November 24, 1632 and February 21, 1677. He became 44 years old. 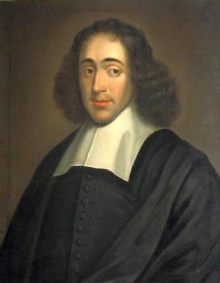 Benedictus de Spinoza, named Baruch Spinoza in the synagogue protocols and known as Bento de Spinoza or Bento d'Espinoza in the community he grew up in, gets along with René Descartes and Gottfried Wilhelm Freiherr von Leibniz considered one of the great rationalists in philosophy in 1600 - century. He was also helping to lay a foundation for modern biblical criticism. Unlike Descartes, he did not go in for a dualistic world view, but was monistic in that he considered Altet as a single whole and termed it as "substantive" (neutral monism). Spinoza showed considerable scientific talent, but the breadth and importance of his work was not fully understood until after his death. His magnum OPOS, his main work, published posthumous, Ethica ("Ethics"), which he opposed Descartes' mind-body-dualism. It earned him recognition as one of the main contributors to Western philosophy. The philosopher Hegel said of all contemporary philosophers that "You are either spinoziker or not a philosopher at all." Spinoza grew up in a Dutch Jewish community. In time he developed a very controversial ideas about the veracity of the Hebrew Bible (Old Testament) and the divine being. The Jewish leaders sent cherem (a form of excommunication) against him, which banned him from the Jewish community. His books were also banned by the Catholic Church. Spinoza lived a quiet life by grinding optical lenses, declined honors those who came to his whole life, including prestigious academic positions, and gave the family inheritance to his sister. He died 44 years old, possibly of tuberculosis or other disease of the lungs due to the fine glass dust he breathed into his profession. He is buried in the Christian cemetery Nieuwe Kerk in The Hague. He is born under the zodiac sagittarius, who is known for Philosophical, Motion, Experimentation, Optimism. Our collection contains 49 quotes who is written / told by Baruch, under the main topics: Happiness, Motivational, Power. "Ambition is the immoderate desire for power"
"Fame has also this great drawback, that if we pursue it, we must direct our lives so as to please the fancy of men"
"Nothing in the universe is contingent, but all things are conditioned to exist and operate in a particular manner by the necessity of the divine nature"
"None are more taken in by flattery than the proud, who wish to be the first and are not"
"For peace is not mere absence of war, but is a virtue that springs from, a state of mind, a disposition for benevolence, confidence, justice"
"Desire is the very essence of man"
"Do not weep; do not wax indignant. Understand"
"Fear cannot be without hope nor hope without fear"
"True virtue is life under the direction of reason"
"To give aid to every poor man is far beyond the reach and power of every man. Care of the poor is incumbent on society as a whole"
"Peace is not the absence of war, but a virtue based on strength of character"
"One and the same thing can at the same time be good, bad, and indifferent, e.g., music is good to the melancholy, bad to those who mourn, and neither good nor bad to the deaf"
"It may easily come to pass that a vain man may become proud and imagine himself pleasing to all when he is in reality a universal nuisance"
"If men were born free, they would, so long as they remained free, form no conception of good and evil"
"God is the indwelling and not the transient cause of all things"
"Be not astonished at new ideas; for it is well known to you that a thing does not therefore cease to be true because it is not accepted by many"
"Will and intellect are one and the same thing"
"Whatsoever is contrary to nature is contrary to reason, and whatsoever is contrary to reason is absurd"
"Only that thing is free which exists by the necessities of its own nature, and is determined in its actions by itself alone"
"If you want the present to be different from the past, study the past"
"Blessedness is not the reward of virtue but virtue itself"
"We feel and know that we are eternal"
"Nothing exists from whose nature some effect does not follow"
"I would warn you that I do not attribute to nature either beauty or deformity, order or confusion. Only in relation to our imagination can things be called beautiful or ugly, well-ordered or confused"
"He alone is free who lives with free consent under the entire guidance of reason"
"All noble things are as difficult as they are rare"
"Whatsoever is, is in God, and without God nothing can be, or be conceived"
"The greatest pride, or the greatest despondency, is the greatest ignorance of one's self"
"So long as a man imagines that he cannot do this or that, so long as he is determined not to do it; and consequently so long as it is impossible to him that he should do it"
"Men govern nothing with more difficulty than their tongues, and can moderate their desires more than their words"
"Desire is the essence of a man"
"Peace is not an absence of war, it is a virtue, a state of mind, a disposition for benevolence, confidence, justice"
"Those who are believed to be most abject and humble are usually most ambitious and envious"
"There is no hope unmingled with fear, and no fear unmingled with hope"
"Sin cannot be conceived in a natural state, but only in a civil state, where it is decreed by common consent what is good or bad"
"I have striven not to laugh at human actions, not to weep at them, nor to hate them, but to understand them"
"I call him free who is led solely by reason"
"How would it be possible if salvation were ready to our hand, and could without great labor be found, that it should be by almost all men neglected? But all things excellent are as difficult as they are rare"
"Freedom is absolutely necessary for the progress in science and the liberal arts"